TRYON, N.C. -- A North Carolina state trooper says a tree fell across a highway, crushing a vehicle from a South Carolina television station and killing a TV anchor and photojournalist. Anchor Carol Goldsmith said on air that McCormick and Smeltzer were "beloved members of our team - our family." 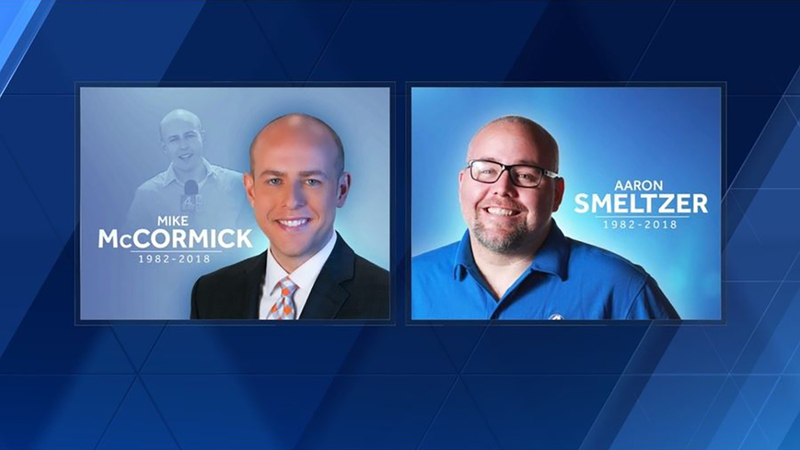 "Two journalists working to keep the public informed about this storm have tragically lost their lives, and we mourn with their families, friends and colleagues," Gov. Roy Cooper said. "North Carolina needs to take Alberto seriously. I urge everyone to keep a close eye on forecasts, warnings and road conditions, especially in western North Carolina where even heavier rain is predicted through tomorrow." WYFF is based in Greenville, South Carolina. WYFF said McCormick "joined the station in April 2007 as a reporter in the Spartanburg newsroom. In 2014, he was also named anchor of WYFF News 4 on Sundays at 6 p.m. and 11 p.m."
Smeltzer was the photographer in the Spartanburg bureau. He "shot news for more than a decade in our region. He is originally from Tazewell, Virginia and graduated from Radford University with a degree in broadcast video communications."